Hey, folks! Regular readers have probably already checked the updated scores, standings, and league news at http://tinyurl.com/padcircus/, but just in case you haven't, feel free to look things over. I am figuring out which files go where when transferring the html/almanac but some links still don't work. I think I will have to add the "History" option in order to display older news items. At least, I think that's what that does. I have no idea, and I haven't read the manual. I tend to wing it. Congrats to Madding and Pedersej! Started off with a hit, went 0-for-5 then grabbed another hit! That was a fun trip down 80's Memory Lane. Wonder we'll end up tomorrow?? Hello, everyone! My thoughts and prayers go out to the families hit so hard after Sunday's storms. While we had a 2am storm woke us up and gave us a bit of a scare, that was nothing compared to the absolute destruction of cities like Mayflower and Vilonia, Arkansas. My town is in southwest Arkansas. I did not open a pack yesterday, trying to keep our "plugged-in" electronics use to a minimum in preparation for the storms, so tonight I am opening two packs. 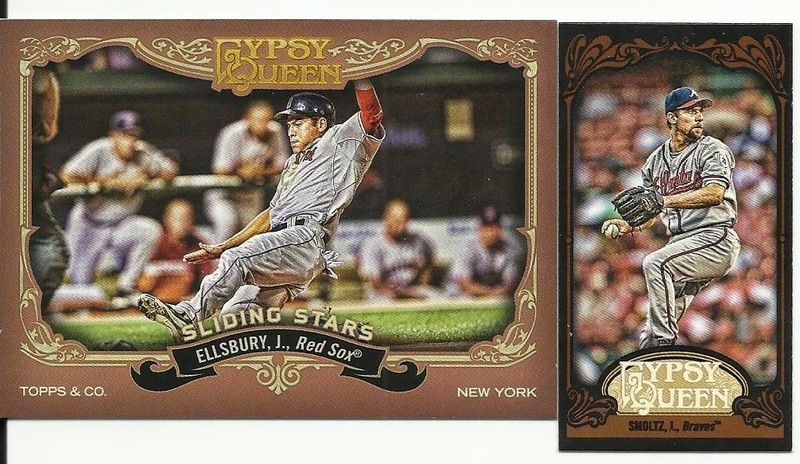 Congrats to you two for snagging cards from this pack. Looks like it was a tough go. 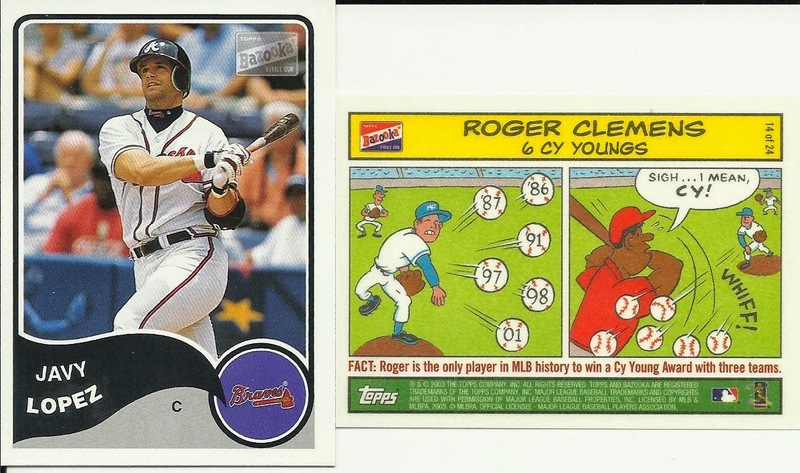 The Clemens comic is a cool take on cards and collecting! Well, that ended up with an interesting pair of groupings. I am a fan of the fact that the cards were spread around to several folks! Congrats, you guys! 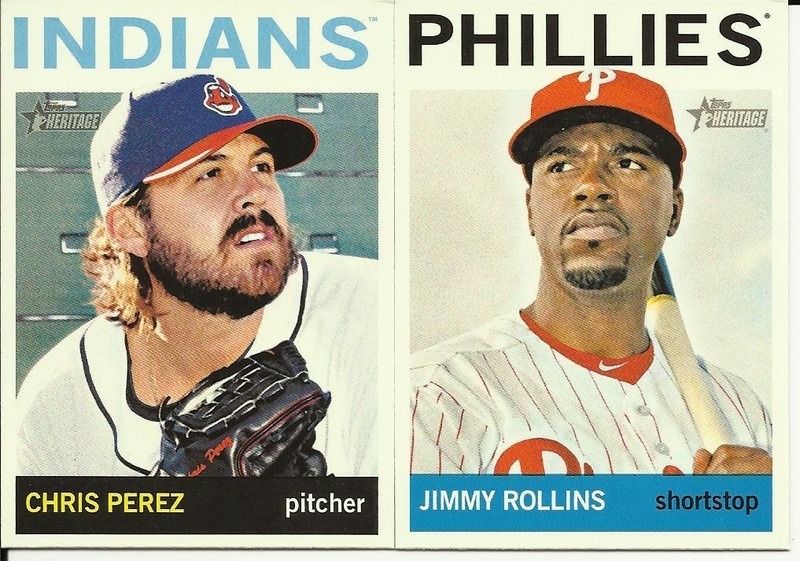 The Tribecards Pack-A-Daily Circus Giveaway Game is upgrading from OOTP14 to OOTP15. I am doing a straight import. I realize there will may player name conflicts, etc. I don't think it will be an issue other than newer players that I created in 14 will have fictitious base stats compared to their live counterparts. I am not changing those players out because I don't want to cause those teams to lose what they've been building. The game easily installs into the default location: its own folder that does not mess with previous versions of the game. That is a HUGE plus in my book, as I hate new versions of programs that arbitrarily install themselves on top of what you already have. The new look mimics modern-day color schemes and the "flat" graphic look, a la Microsoft Metro or iOS7. If you like those looks, then you will be pleased by the new design. If you are not a fan, then this will be "one more thing" that has taken to the trend. 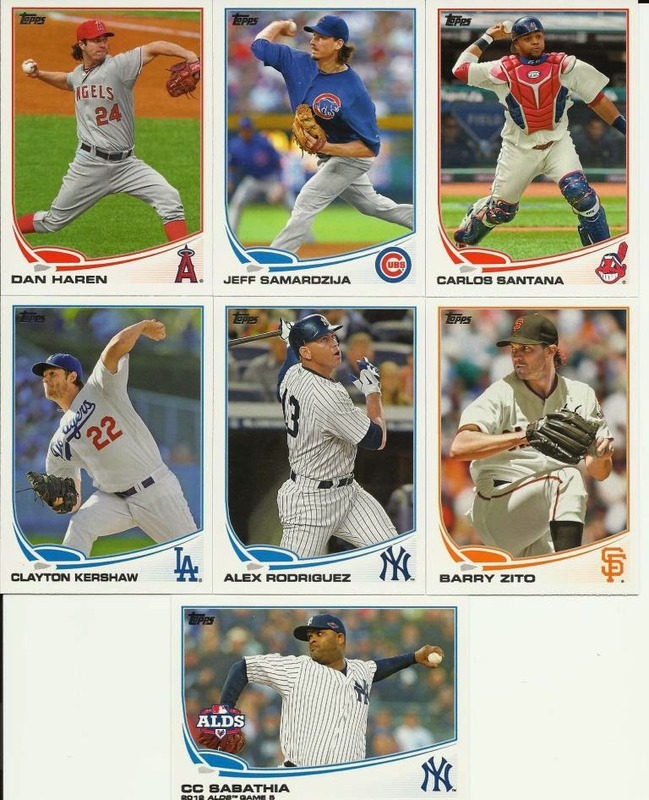 I am not a fan of the look, generally, but I do like how OOTP15 wears it - at least at first glance. I'll let you know more once I get into the game a little deeper. As soon as I installed the game, I entered my key and selected "Import OOTP14 game" (or however it is worded). That process is not fast. I believe the reason stems from the way I set up PADCircus in the first place. Remember, I imported the WHOLE player list. Most games people play are not based on EVERY single player to have ever played the game. Haha! As you can see in the image above, the buttons have all been reworked with the flat-style rendering. I have to admit, it gives the game a completely different feel. The new menu system takes some getting used to. 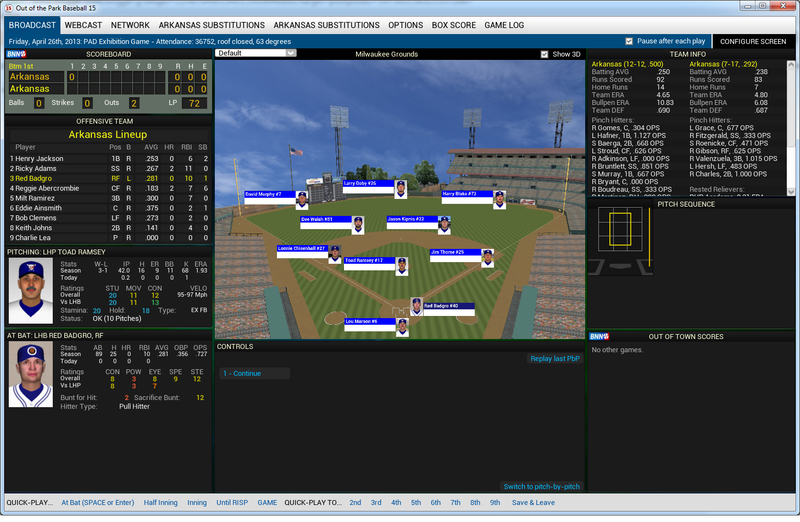 In ootp14, each main menu was basically full of everything you could do from that option. In ootp15, there are submenus (ex: "Player Info" now leads to "List all players, Free agents, etc." Definitely takes some getting used to, trying to figure out how to do what you used to do. That is no different than most software updates, though. As for duplicate player names, it occurred to me that I would have to import the full player list again in order to have that happen. So, for the purposes of PADCircus, I will *NOT* be doing that! I will continue to create new players as needed. I realize what I am about to say probably only applies to me, in the way I use ootp, but I wish I could assign a player to a team directly fro the "All Players" list. That is, I wish I could right-click, Assign to team, have it auto-populate the list of teams and then pick the team I want. 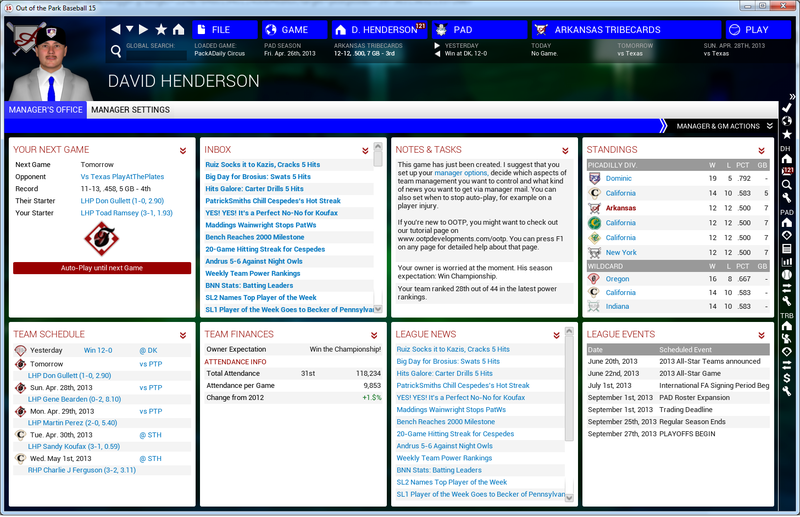 Right now (as in ootp14), I have to click the player's name, edit the player, then assign him to a team. That's a lot of steps when you are talking about doing that for 40-50 players at a time across all the teams. The biggest difference in the interface I see are the removal of tabs. Instead of individually rendered tabs, each menu/choice gets highlighted as you hover over it. It makes for a much cleaner, unified presentation. For fun, I tried Tweeting the Koufax Perfect No-No through the game's interface. That took me to an ootp 13 page and said it posted to Twitter, but I couldn't find it on there if it did. I decided to try an exhibition game between the Tribecards and the Patricksmiths (both are Arkansas teams!). The set-up was easy, and I set everything to computer AI just for fun. The *REAL* fun came, however, when I turned on the experimental 3D mode! This is WAY cool!! As you can see in the screen shot above, the stadium is rendered in 3D with player names and pics shown on field. When you hit a ball, a 3D ball heads off in the direction based on what is happening in the simulation. This is seriously one of the coolest ways to watch a simulation, in my opinion. I usually just let the games run themselves with no on-screen display at all. But, this makes watching some of those games come to life. What a cool feature! I switched over to "Webcast" and was presented with an overhead 2D field with names, etc and an animated ball that flew on the screen depending where the batter hit it. I will have to figure out how to webcast and make sure that we webcast the PAD Circus World Series (maybe even the playoffs)! Hahaha, while playing the simulation, the background noises add a fun piece to the atmosphere. The fans get mad when the visiting team hits a homer, they cheer when their team makes a great play, etc. I don't if ootp14 had that or not, but it's another way to enjoy the games. After the 4th inning, I selected "Quick Play To..." and jumped ahead to the 9th. I let the game play it out and the Tribecards won the exhibition game 3-1! Too bad it didn't actually count! Haha! Overall, my first impression of the game comes down to two things: The interface update makes things much cleaner (though it takes some getting used to) and the game itself adds some fun features while still keeping OOTP the award-winning program it has been. I'll be posting other thoughts as we move throughout the season here in the Pack-A-Daily Circus! #PackADailyCircus - Drafts, Players, and Packs, oh my! Somehow, Jeff Cirillo escaped my eyeball yesterday. The Thorzuls already own him, so I had to drop him from the Quarrys Bonus Pick after running the draft. I discovered that Neftali Feliz was supposed to go to Play At The Plate according to the first draft, but somehow never made it to his team, I guess. Feliz has been added to Play At The Plate. Al Oliver is already owned by RJBreezes. Sorry, PlayAtThePlates. Somehow I missed that. Play At The Plate already owns Mickey Rivers. :-) Nice try to put him on your team twice though. Kate Upton has been drafted by Play At The Plate. That should prove interesting. I am waiting for clarification on a couple players (those managers were sent emails). Once I have that, I will let ootp fix everyone's rosters. While we wait, let's bust some wax. We have a pack to open to make up for Friday, plus it is Super-size Saturday! The non-players from this pack will be randomly given to managers. Speaking of, congratulations to those who pulled cards out of this pack! 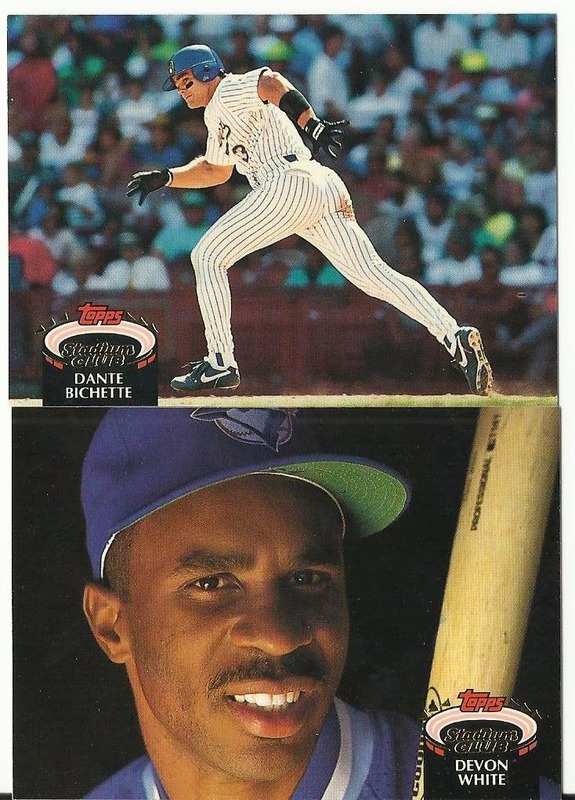 I always did like what Panini was able to show off without an MLB license. Wow! We had at least SIX managers pull multiple players! That is great for them. Not so much for those of us who didn't pull anything, though. haha!! Ah well, nature of the beast! Sorry, folks. Keep nodding off at the keyboard. I will have to pick this up in the morning. I will open multiple packs to cover the delay. The goofy TypeForm system did not record all picks. It recorded my first two drop-down picks but then nothing until my write-ins. Several other folks were missing drop-down picks but had write-ins. i don't know if those folks actually did not do any drop-downs or if the system hosed their picks like it did mine. As a matter of problem resolution, I used the results as they were. Managers can try to work out trades for any players they did not get, but someone else did. Any players listed that are already owned by someone were removed from the draft. Any empty spaces were collapsed before the draft. Ex: 1 pick, 3 spaces, 2 picks. After the collapsing fix, it would be 1 pick, 2 pick, 3 pick with NO spaces between. In other PAD News, I will be hitting the Bonus Draft shortly, then the weekly draft. I will also have a pack of cards to bust open, of course! We have some weird things going on for sure. First of all, I have no idea why certain news stories get copied over to the site and some do not. The biggest news story of the week is Koufax tossing a perfect No-No and we can't read about it!! AUGH!! I will see if I can get those files and copy the story here. In other league weirdness, the Picadilly Division sports FOUR teams all tied with 12-12 records! That is great news for the Tribecards, considering how awful my team has been this season (though, admittedly not as bad as some [cough, cough, Jafronius, cough]. I will be running the "Bonus Draft" later tonight and kicking off the regular weekly draft after that. Speaking of the "Bonus Draft," the online system I chose (TypeForm.com) is cumbersome and has a design flaw that allows you to write-in anything on the drop-down items. Why bother having a drop-down if people can type their own responses!? Oy Vey. So, once again I am looking around for a reliable way to collect draft picks. Though, to be frank, it's looking like my best bet is to have everyone just email me their picks and let ME do it by hand - monitor and adjust, as they in education. Hello, folks!! Welcome to today's pack break. 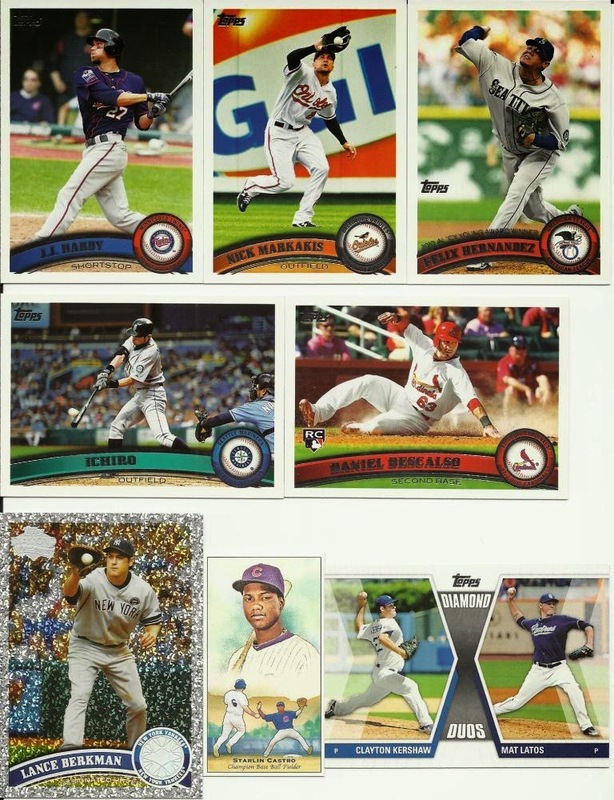 For your collecting enjoyment, I've got a pack of 2013 Archives (edit: I typed the wrong model before, while LOOKING at the pack! Haha!). Actually, it is a "Jumbo" pack of 18 cards. Let's see what we can dig up! Wow! Three managers each pulled two players! That is awesome! I was surprised at a couple of the free agents. Maybe they will be snagged up in the bonus draft. If not there, then certainly in the regular weekly draft. 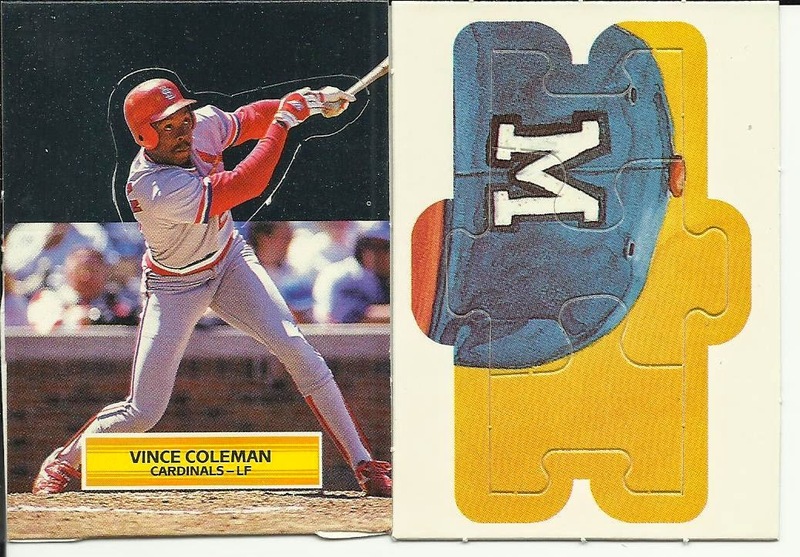 That Sale mini is kind of a weird specimen, but the Ozzie Smith card should have been a real one from that era. That would have been cool. Still, a hearty congratulations to the successful managers! Good evening! I hope everyone is enjoying their Wednesday night. My baseball team faves were split tonight: The Indians won (Wahoo!!) but the Pirates lost (Boo!!). Maybe things will pick up for both teams. They are each over .400 but they are far down the list in their divisions. Nothing like a pack of wax to bring up the spirits, right? 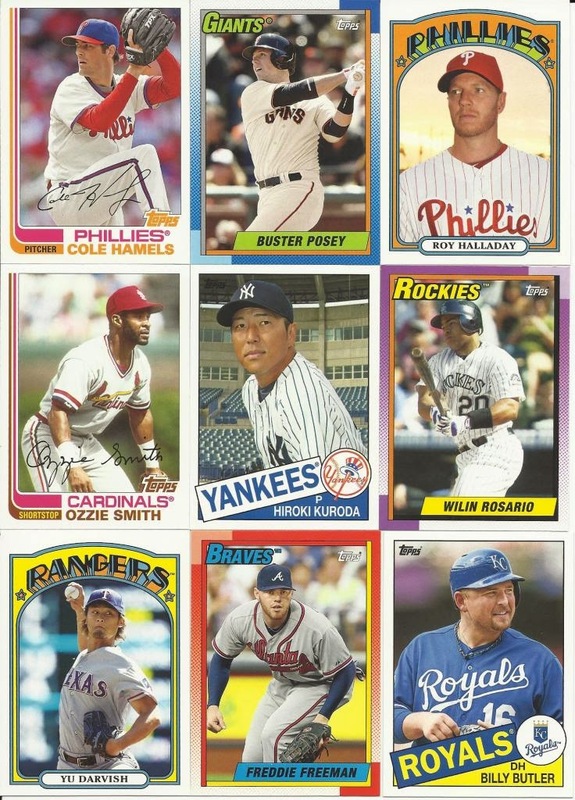 That Smoltz mini is a great card! Truth be told, I'd take any of these for my non-Triber collection, so a HUGE congrats to each manager snagging some cardboard for their collections! 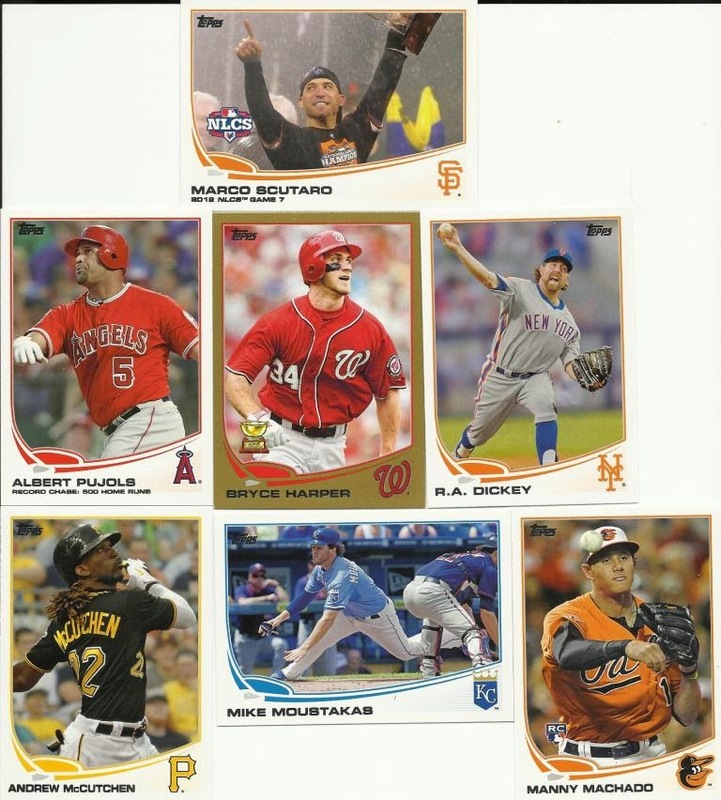 For tonight's pack, I am busting open a pack of 2014 Topps Stickers. I don't know how anyone else feel about stickers making their way back into collecting over the past few years, but I am all for it! Guess that's just part of the kid in me. Wow! 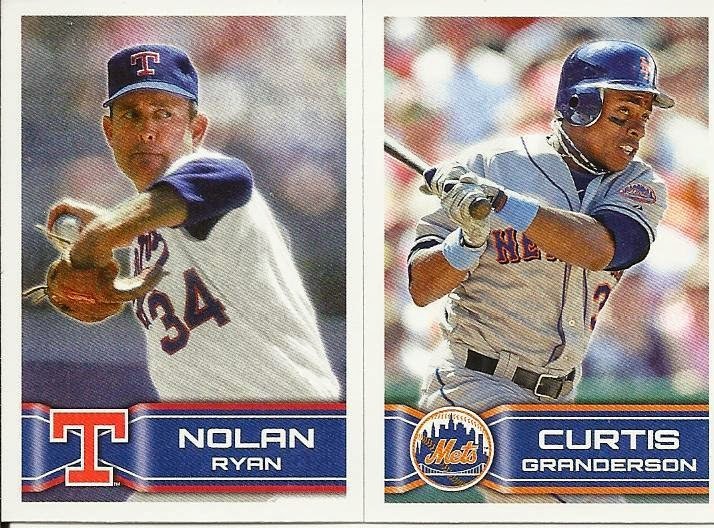 Ryan and Clemente in the same pack! That is very cool!! Congratulations to EG9460s for pulling two players and to the others for snagging a hit out of the pack, too. This weekend, I hope to have tallies so we can see how many cards each manager has pulled. I think I have a couple. Or maybe none. I don't really remember now. Last season, we had an issue with Google Forms not displaying everyone's draft picks. I thought I had that cured, but the feedback I've received shows me that is clearly not the case. I admit, my plan was to email everyone not on the draft list before running the draft and I forgot that tidbit before doing it. That still doesn't address the core issue: Google Forms is far too unreliable for this project. So, I am going to find a different venue for hosting the drafts. As a "kiss and make up" peace offering, I am going to create a combination draft and release it either tonight (Tuesday) or tomorrow (Wednesday) depending on how quickly I can find a new survey venue and how quickly I can get things set up. What is a combination draft? I will include current free agents from the breaks to this point, PLUS there will be 10 slots for managers to write in your their draft picks. Please note, some undrafted revealed players may be missing from drop-downs because I am doing this on my lunch hour and I don't have access to my, er, Access database. Managers will need to check the current Manager/Player list to make sure already-taken players are being sought! The combination/bonus draft will END on Friday, April 25 at 5p. Late Friday (since my daughter has a softball game), I will run that draft and fire up a new draft to cover players revealed between now and then. Well, it all makes sense in MY head anyway. On the upside, I have posted the ootp updates through today (April 22). Yeah, I know, I have the game taking place LAST year, but that's just a technicality. Haha! Hey everyone! In the mail today, I had a box from RAZ! In the box? A slew of packs for the Circus! 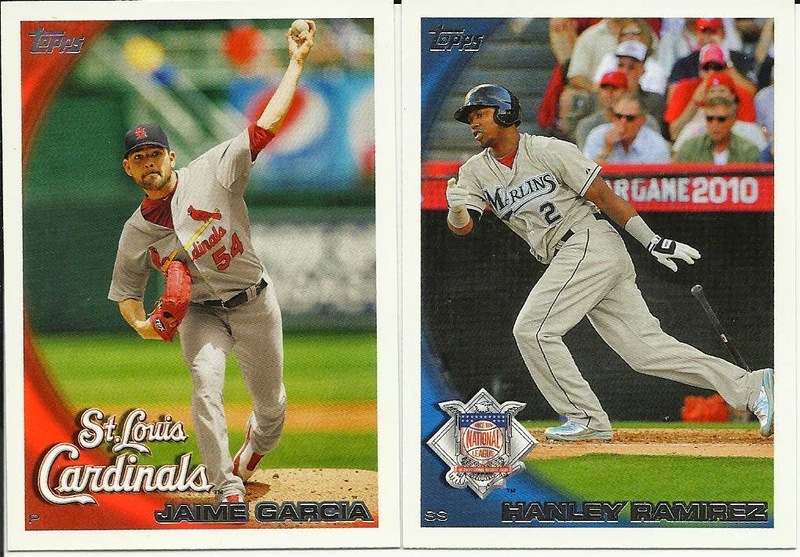 he also included a 2014 Carlos Santana and a VERY cool 2014 Kipnis alternate logo (#344/999)!! Wow!! THANK YOU, Raz!! That is very cool!! These will be added to the box of packs. We'll see these throughout the season for sure. I remembered that my initial plan was to randomize the draft order and then use that as the basis for future drafts instead of randomizing each week. Of course, the problem we run into is that we have WAY more managers than there are weeks of baseball! So, I still to devise a draft order method that spreads things around more evenly. 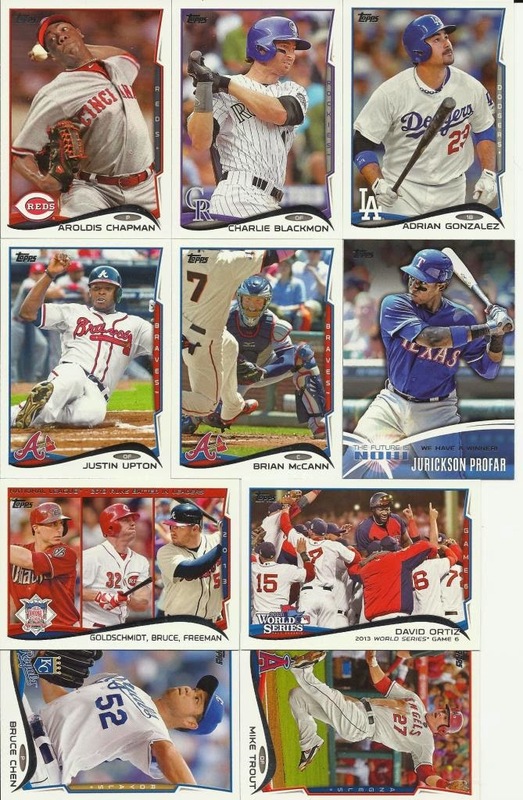 The 2014 Red Sox Puzzle counts as one player. It has been entered as "RedSox Puzzle2014" in the game as a random player. I can change the position to whatever you like, if you end up with the cards. Mascots were generated as fully random players. If you end up with a mascot, I can change the position to whatever you like. Polo Grounds was created as a random player. I can assign whatever position you want, if you end up with this card. Subsequent ballparks will be handled the same way. Buck Showalter (and any future manager cards) was randomly generated. I did NOT email managers to remind them the cut off time/date. In the future, I will be sure to include the cut-off time and date in the draft notice email. Generally, however, the draft starts on Friday and ends the following Monday. If this is not enough time or doesn't meet your work/class schedule, please let me know and I will see what we can do. ootp15 is out now. I am trying to decide if I should try to import our game into that or not. I had a heck of a time getting ours set up, and I don't want to mess around with something that is currently not broken. I am working on another "open" draft. This will allow managers to grab more players without waiting for the cards to be pulled. TRADES: If you would like to trade for players, use the "Current Manager/Player" list to find out who has the player(s) you want. You can then let me know who you want and I will let the other manager know you want to trade (unless you prefer to handle this between you and the other manager directly). Once a trade is presented and agreed upon, I will make the necessary changes in ootp and swap player cards accordingly. I will post game info on Tuesday, April 22! My team can't get out of the basement. UGH! Whew! Okay, let's finish out this evening with a pack busting! Let's go back to 1991. Happy Easter, Resurrection Sunday, and Birthday to anyone celebrating any or all of those. Wait! *I* would be one such person! Hard to believe I am 45 today. I certainly don't feel 45, whatever that is "supposed" to feel like. The best surprise I got for my birthday is a very cool baseball trip with the family coming in May! We will be taking a train down to Dallas to watch the Rangers play!! I think that will be a great adventure for the whole family. What a cool birthday (er, and Anniversary and Father's Day) gift!! 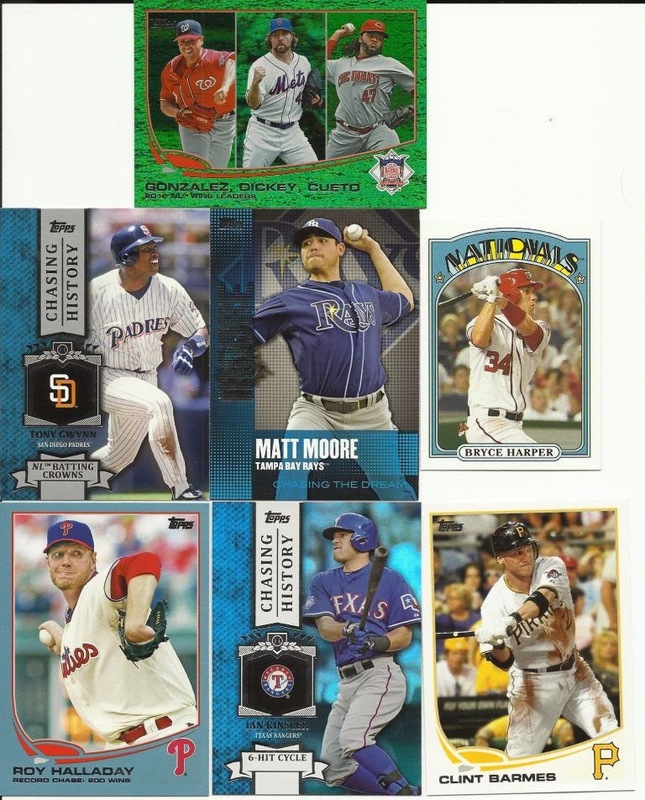 I also got a slew of baseball packs, too! Today, we are busting open a pack of 2013 Heritage. Let's see what we can find inside! Wahoo!! We pulled a Triber this time! That makes for an even happier birthday! 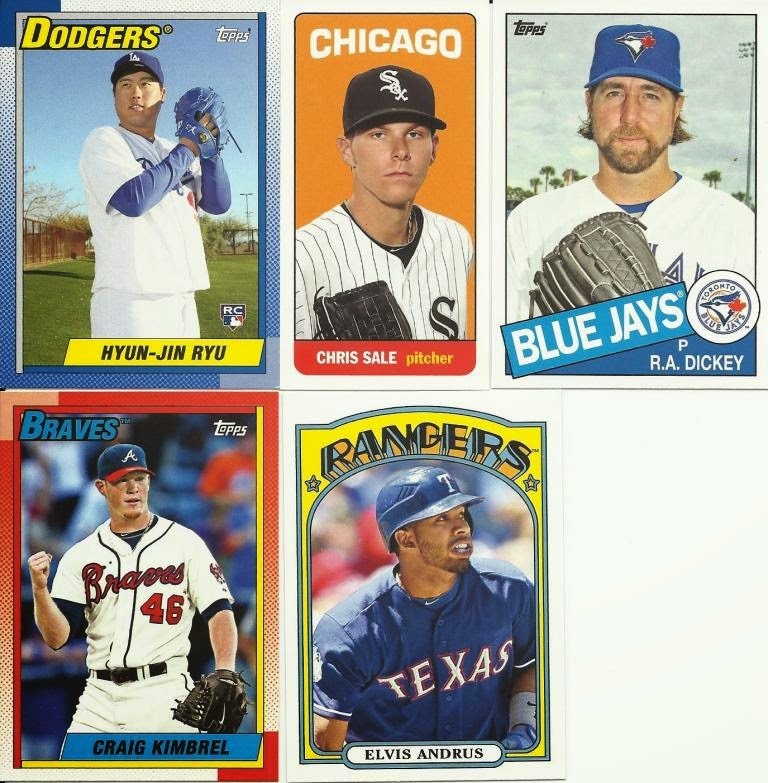 Congratulations to each of our managers who added cards to their collections. Oh, what the heck.. It is my birthday, after all, so let's bust open a Fat Pack to make up for yesterday! Andre Ethier - Dodgers - Trhdds (Wahoo!!) - Back-to-Back! Felix Hernandez - Mariners - RyanGs (Wahoo!!) - Back-to-Back! WOW! 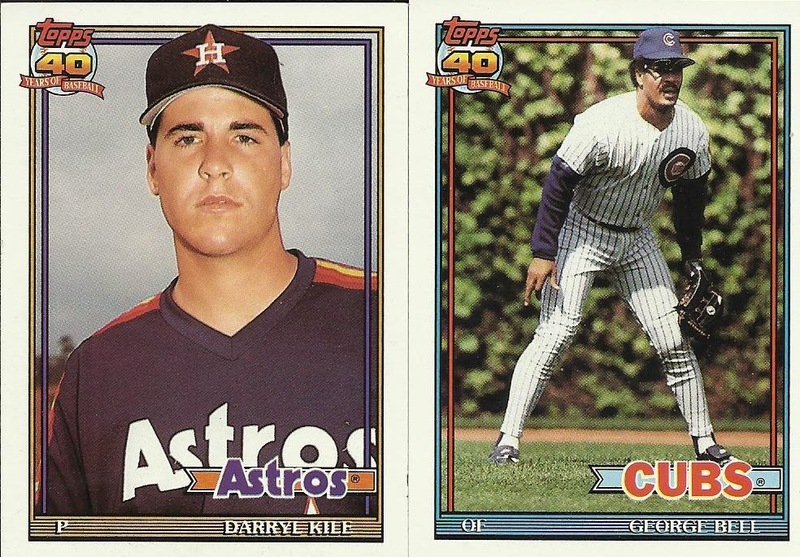 Two managers went back-to-back in that pack! We also pulled another Triber, too! 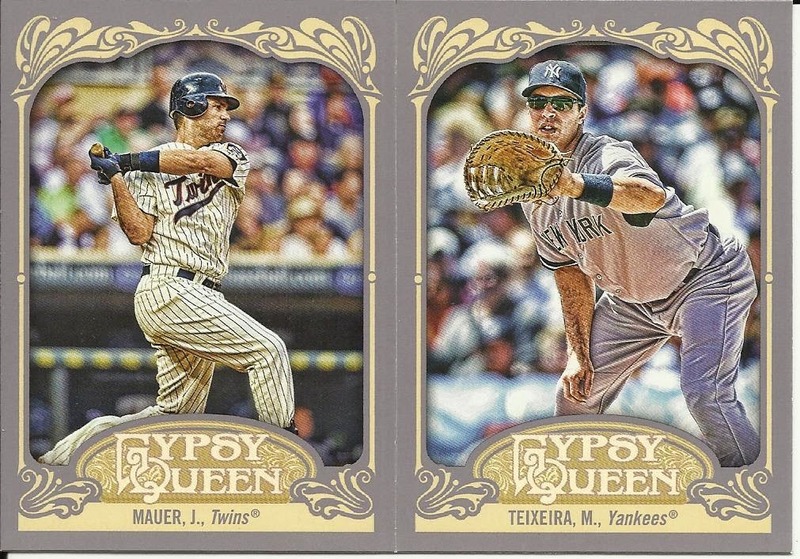 That's two Indians in two packs. Congratulations to ALL the managers who pulled cards out of here! We've got a slew of folks adding cards to their piles! 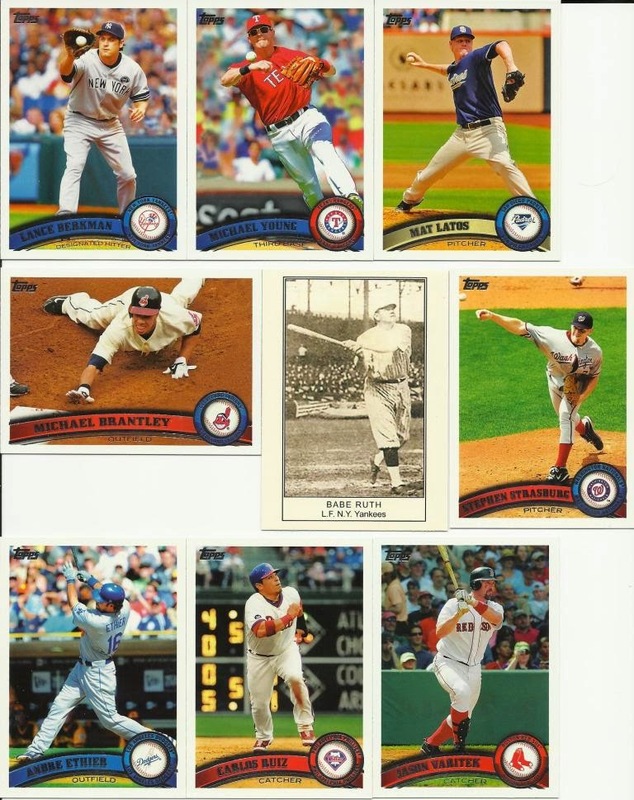 That Babe Ruth card is very cool! And, of course, shiny makes most of us happy, so the Berkman Diamond is a special treat, too! Don't forget the Mini, either. My daughter would be going nuts to have anything mini. Overall, a great collection of players from this pack! My family took me out for a very fun pre-bday celebration! So, no Saturday post. Happy Easter, everyone! I will see you later on Sunday. This week's draft is now open!! We have nearly 70 players, mascots, non-players to choose from! So, that means there are up to seven (7) players the managers can pick. I forgot to tell the managers that the draft ends on Monday at 6pm CST. I'll have to do that. While the managers pick their players, let's but open a pack of cards! Remember, any free agents pulled will appear in the NEXT free agent draft, unless they are already in this week's draft. 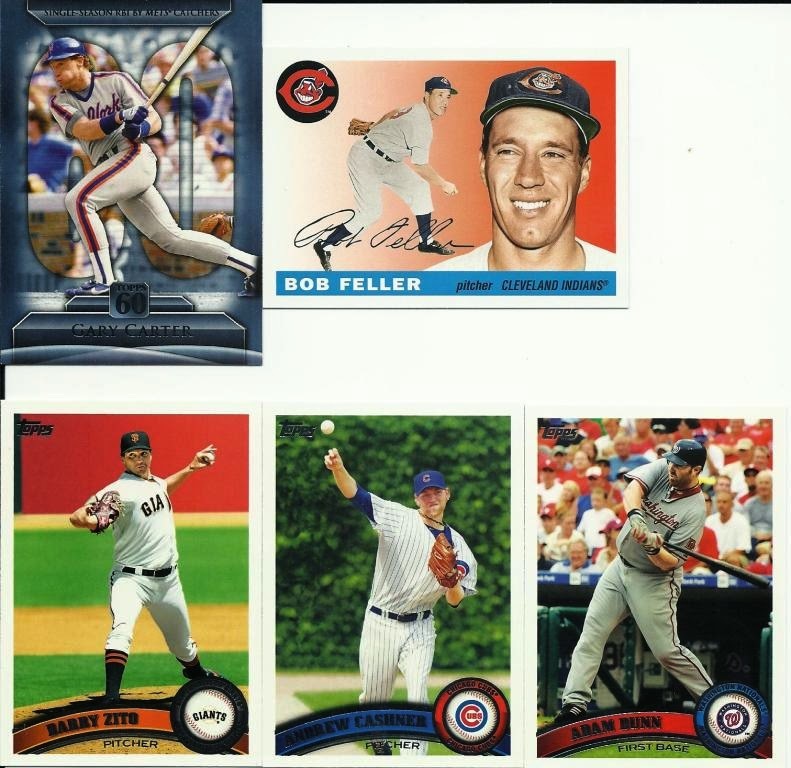 Last season, I received a 1997 Pinnacle Inside can with Kenny Lofton on it. I said I wasn't going to open the can. I changed my mind. Most of you know how I feel about cards and their freedom. 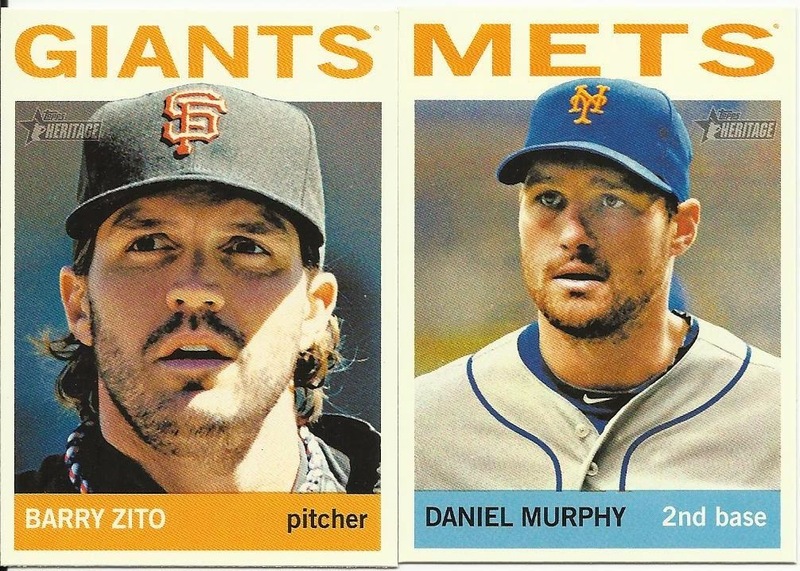 Well, these cards are now free from their tin/aluminum/cello prison! Congratulations to the BoRosnys for pulling two cards out this pack! A big congrats to everyone that snagged cards out of this one! Now, I am off to make my picks for this week's draft! 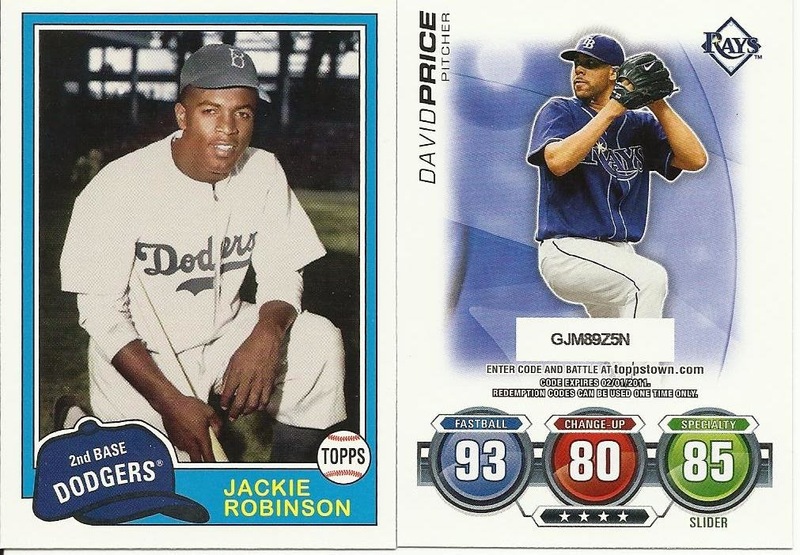 Greetings, cardboard collectors and baseball fans! As a special lunchtime (CST) treat, I have the updated standings, box scores, player info, and more posted for your enjoyment! Good evening (or morning or afternoon, depending on where you are in the world and/or what time it is when you read this)! I am loving the conversations going on in the comments, especially those surrounding team activity in the OOTP league. That has really added a whole new dimension to this giveaway! 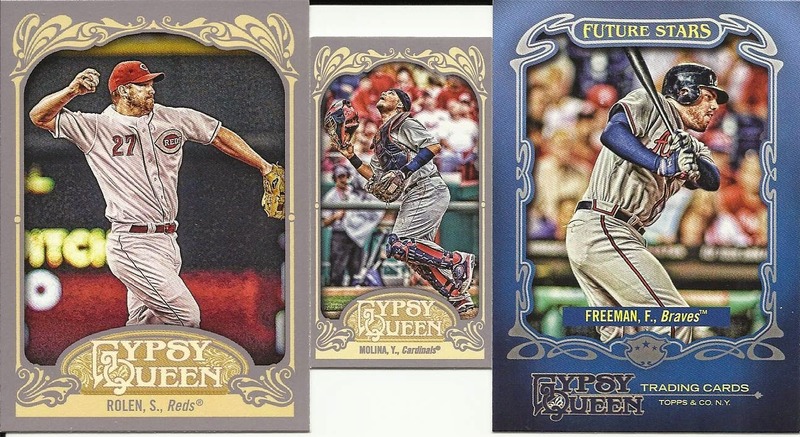 Speaking of dimensions, let's take a step into the retro machine and bust open a pack of 2012 Gypsy Queen. We batted .500 on the Gypsy Queens! Not a bad take. The Erins have snagged a few Molinas already, and I think that is a couple Freemans for the Cap'n! Congratulations, managers. Man, this week's free agent draft is going to be a toughie! I've updated the OOTP14 game: http://tinyurl.com/padcircus/ so feel free to see how well (or, in my case how poorly) your team is doing so far. BTW, managers, if you don't like your team's nickname, let me know and I'll be happy to change it. I went by the name you gave during sign-up or made one up if you didn't provide one. I am not stuck to these, though. I can easily make your team YOUR team! As a matter of conversation, before I run the simulated games each time, I have the AI set the line-ups, etc. That way, teams with injured players can sub those, pull rotations set by the game, etc. I was told OOTP does a good job of handling the day-to-day stuff. Plus, I figure if I do that for everyone, then no matter what, we can all blame (or praise) the program for our team's performance. Puzzle #312 - Yeah, I have no idea what to do with puzzles like this. Hmm, I just tried to pull SUN SUN's stats and s/he doesn't have a player page. Not sure what happened there. Oh well, hopefully there will be a page eventually. Still not sure how some of this OOTP works. Well, the first draft out of the gate and I have errors already. Yoy. I mistakenly listed "Doug Fister" as a free agent, when the Ontario Kazis had already drafted him. As for Fister, sorry Quarrys, I dropped the ball there. Not sure how Fister ended up in the draft. You still got Rex Brothers, fwiw. Somehow, I managed to leave Kevin Brown off the GCRLs when I ran the games through Tax Day. He's been added and will appear in subsequent games, should the OOTP AI decide to put him in. I have also run the baseball games through April 15, so I will post those sometime on Tuesday! I know several of you are chomping at the bit wanting to know how your team is doing. As before, I will post the tinyurl to get you to the info once I have it posted! I think I will shoot for a Tuesday/Friday kind of thing. We'll see how that goes! The Manager/Player list has been updated! 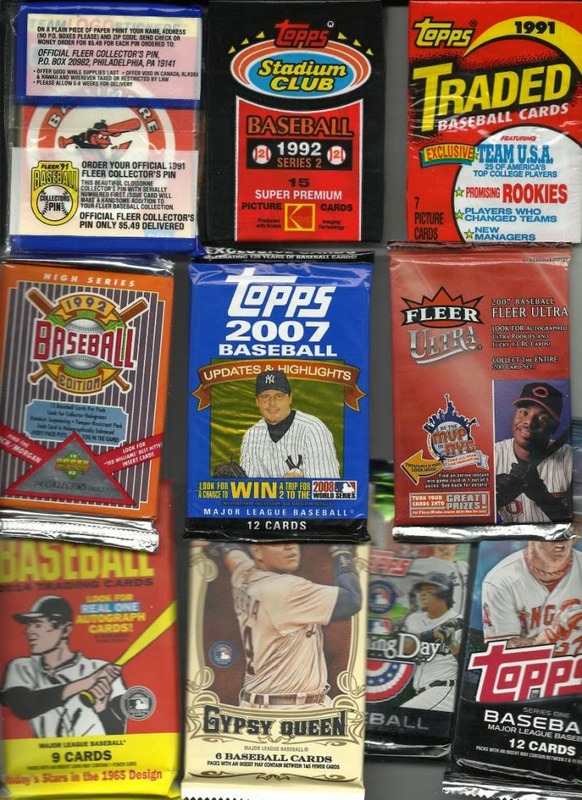 Now, let's get to ripping a pack for tonight! Wahoo!! We pulled a Triber! And, he is a free agent, so several of us will be trying to snag that player, I know! Congratulations to the managers that, er, managed to grab a player from the pack. We did not have many hits tonight, that's for sure. I finally got to run our first free agent draft this evening. As predicted, several folks got shut out. But, some managed to grab more than one player! That's always cool, especially when the pool was limited. What's that mean in terms of results? Well, it means some players had a lot of folks vying for them while other players had only one manager seeking to add them to the collection. To refresh everyone on how the draft works. Once the list is randomized, I start at the top with 1st pick column. I remove all duplicate picks and shift things to the left. So, let's look at BSnider as an example. Dayf picks Cedeno first. I delete Cedeno from BSnider and his 2nd round pick becomes his first round pick now because the list "collapses" to the left. Same thing applies for anyone else picking Cedeno and so on for each player. When I get to the bottom of Round 1, I start at the bottom of Round 2 and work my way upward. 3rd round starts at the top and goes downward. Repeat until all rounds are completed. Congratulations to everyone that added cards/players to their collections!! I will add those players to your teams and then let OOTP make whatever substitutions it sees fit.